Join us this weekend for Think Bigg with Trent Arterberry! Ratcheting Roboman discovers the reaches of his body. The three-foot tall human puppet Mr. Bigg dances to rap and Russian folk songs. Children participate both onstage and in their seats. Storytelling, mime, music and puppetry blend to create endearing, hilarious characters in this uniquely entertaining all-ages show. 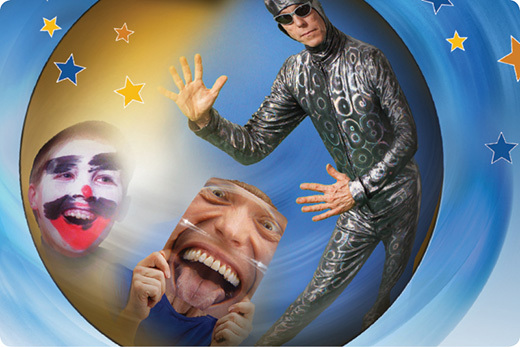 Trent Arterberry is an award-winning performing artist whose unique brand of physical theatre combines masterful mime, poignant monologue, comedic speaking characters and dramatic narratives. Admission is free. No registration necessary, but do come early as this is a popular program. Each 45-minute workshop takes place twice, at 11am and 1pm. This workshop is recommended for ages 4 and up, but all are welcome! And when you're at the ArtStarts Gallery this Saturday, don't forget to drop off your favourite book for A Good Book Drive! We have special bookplates for you to tell the world why that book is the best. Saturday is the last day we are collecting books this year! All booked donated until the end of November will be donated to the children's literacy program, One to One, which provides one-to-one tutoring to children in elementary schools during regular school hours.